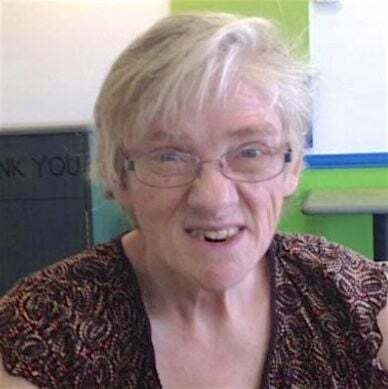 SIERRA VISTA — Juanita Ann Crowe, 62, peacefully transitioned to Heaven surrounded by her family in her loving home with AIRES on Sunday, April 7, 2019, at 3:03 p.m. Until her passing, we took the time with delight reading to her, playing music, and reminiscing about her beautiful life, and continued to talk and comfort her through her last days with us. Juanita loved dancing, humming, singing, completing 1,000-piece puzzles, coloring, animals, and babies. She and her great-niece, Tess, cherished each other’s company. She was such a precious gift from God who loved everyone. Juanita enjoyed mystery shows, all the while shaking her finger at the TV, instructing the actors to do the right thing. She enjoyed being pampered, wearing jewelry, and having polish on her nails. Juanita kept her sentimental gifts for many years, letting people know, “I still got it.” Her stuffed animal Pinky comforted her in times of need. Whatever needed adjusting to make her comfortable, she would say, “That’s much better.” Juanita had a fun-loving personality and enjoyed butterflies, smelling flowers, and talking with people. She was preceded in death by her parents, Rev. James Lee Crowe (June 2, 2008) and Betty Joyce (Franklin) Crowe (June 7, 1996); and sister, Betty Lou (Crowe) Thompson (January 16, 1990). Juanita is survived by her brother, James Leroy Crowe, Mesa, Arizona; sisters, Cathy Joyce (Crowe) Weidemann, Huachuca City, Arizona — her children Loretta Ann (Weidemann) Durham — husband, Mike, their daughter Teresa “Tess” Joyce Durham; David Weidemann — wife Morgan, their children Elsie and Elliot; Jeannie Marie Crowe; Mary Jane (Crowe) Wagner; and Carolyn Sue (Crowe) Dow with her husband, Lloyd George Dow, their daughter Emily Brynn Dow, all of Sierra Vista; and cousins; nieces; and nephews. Juanita touched the lives of so many people with her kind spirit, and she will be deeply missed by all. Please make donations in loving memory of Juanita Ann Crowe to the American Cancer Society. Homegoing Services will be held at 10 a.m. on Saturday, April 20, 2019, at Seed of Abraham Christian Center International, 1100 El Camino Real, Sierra Vista, AZ with Elder Brandon C. Jeter officiating. Cremation arrangements were made by Hatfield Funeral Home, Sierra Vista, AZ.